Can you think of a better way to start your day than with a decadent chocolate muffin with ribbons of cream cheese running through it? 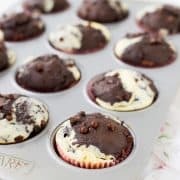 These chocolate cream cheese muffins make for happy, happy mornings! I have friends (lots of them!) writing cookbooks and it’s just the coolest thing ever. The amount of work that goes into a cookbook is insane (or so I’ve heard!) and I’m incredibly honored to be surrounded by so many motivated, hard-working, entrepreneurial women. It’s truly inspiring to see so many women chasing living their dreams. My dear friend Jocelyn is no exception. Jocelyn wrote a cookbook while simultaneously running her blog (Inside BruCrew Life), taking care of her children, and moving across the country. Amongst many other things, I’m absolutely sure. Jocelyn is one of the best people I’ve ever met and I’m so happy for her and her beautiful work of art, Cheesecake Love. Okay, I have a very hard time not including every single recipe on that list, but you get the idea. 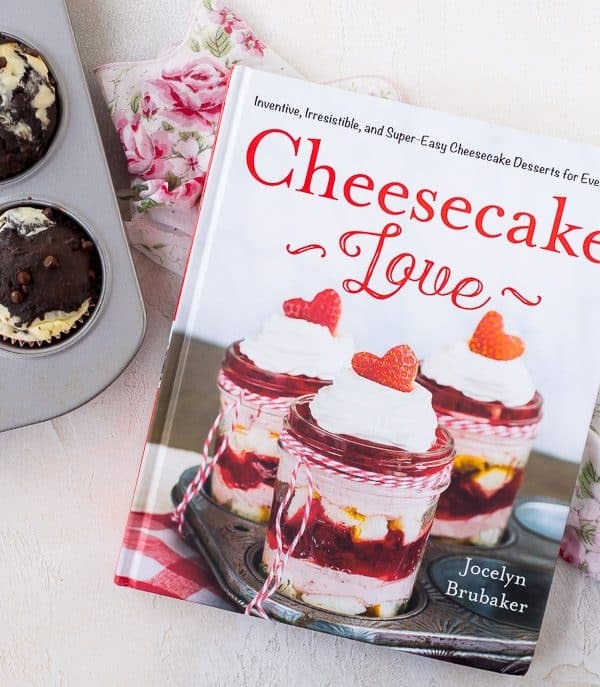 So much good stuff in this book – it should be your go-to resource for all things cheesecake! I did make a couple very small changes to Jocelyn’s recipe and they still turned out amazing. 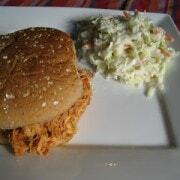 In the text of the recipe, I included her original recipe and then also the small changes I made. (The recipe was great the way it was, but I wanted to make it fit with our lifestyle a little better). I substituted 1 cup of whole wheat flour to make these 50% whole wheat. Our family is very accustomed to eating 100% whole wheat baked goods, but we thought the texture of these was great with the whole wheat flour. I also used Greek yogurt instead of sour cream, because I always have Greek yogurt on hand, but sour cream usually only makes an appearance if we’re having people over for Tex-Mex. Tip: Shake your cocoa powder through a fine mesh strainer or sifter to get a lump-free texture! 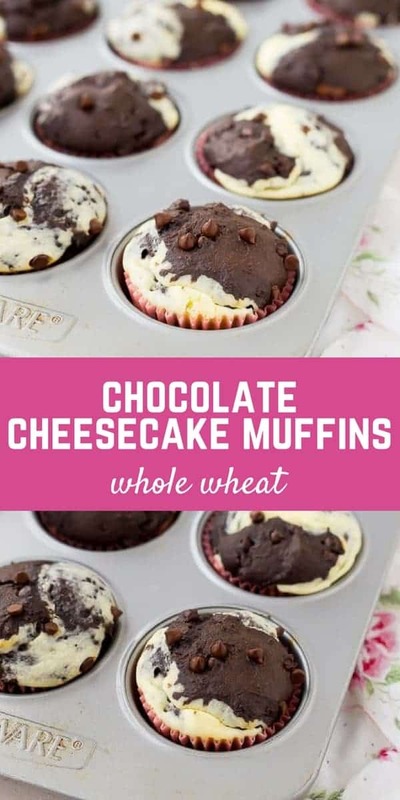 In regards to the nutritional information on this recipe – I calculated using my substitutions as well as reduced-fat cream cheese and 2% milk. Remember that my nutrition information is always just a guideline and you are responsible for calculating it exactly if you desire or need to. It can vary wildly based on what type of ingredients you buy, and even the brand that you buy! 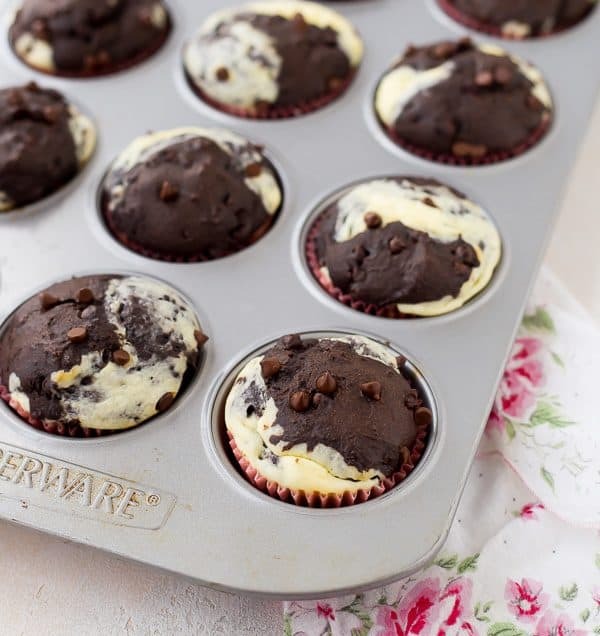 Buy Jocelyn’s book here to get this recipe for chocolate cream cheese muffins and MORE! Preheat the oven to 400°F. Line a 12-well cupcake pan with paper liners. Line eight wells of a second cupcake pan with liners. For the Muffins: Beat the butter and brown sugar until creamy. Add the egg, vanilla, and sour cream and beat until smooth. Stir together the cinnamon, baking powder, baking soda, salt, cocoa powder, and flour in a bowl. Slowly add the dry mixture and the milk to the butter mixture, alternating between the two. Stir in the mini chocolate chips by hand. Set the batter aside. For the Cheesecake: Beat the cream cheese until creamy. Add the granulated sugar and beat until smooth. Add the egg and beat until fully incorporated. Do not overbeat the batter. 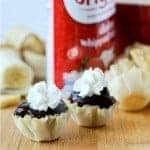 Place one spoonful of the muffin batter in the bottom of each cupcake liner. Spoon the cheesecake filling evenly over the top of the batter in the liners. Top each liner with the rest of the muffin batter. 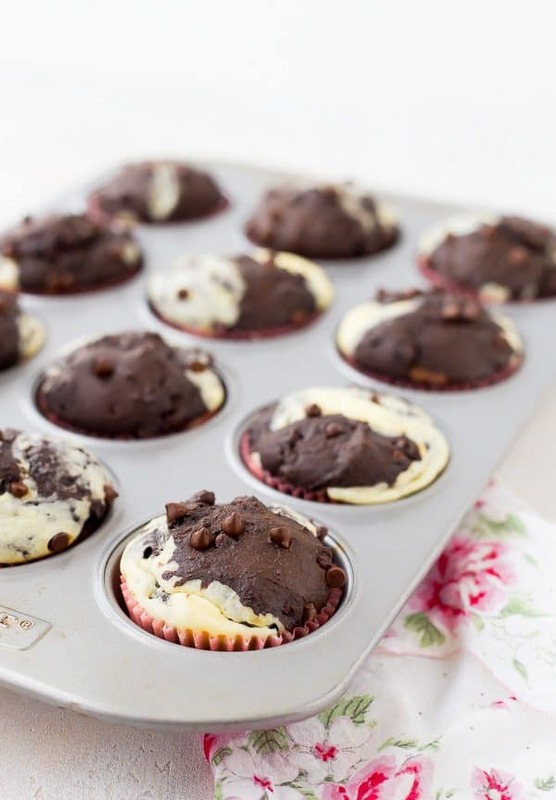 For the Topping: Sprinkle the tops of the muffins with the mini chocolate chips. Bake the muffins for 16 to 18 minutes. Remove the pan from the oven and let the muffins cool in the pan for 5 minutes, then gently remove them from the pan and place them on a wire rack to cool completely. Note: I replaced the sour cream with plain Greek yogurt (nonfat) – it’s what I had in the fridge. Both will work! Note: I used 50% whole wheat flour (1 cup) instead of 100% all-purpose. Note: I used 2% milk and reduced-fat cream cheese. Nutrition information reflects all my substitutions. Recipe used with permission from Cheesecake Love by Jocelyn Brubaker. Verdict: Let’s just say that I’m really glad Whole30 is over. Husband’s take: Ben loved these muffins and the kids were O-B-S-E-S-S-E-D with them. These are definitely closer to a cupcake than a muffin, so they were on cloud nine. 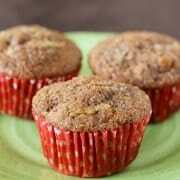 Difficulty: There are two components to these muffins, so there are slightly more time consuming than a typical muffin. It’s worth it, but it takes a little extra time. Put some good music on and enjoy some baking therapy! Woo hoo! 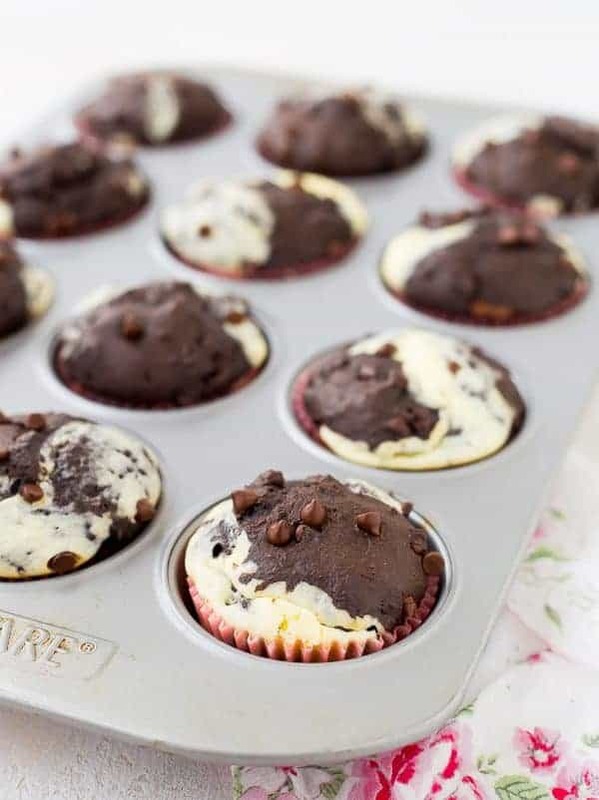 Love the healthy substitutions you made to these muffins! And thank you so much for sharing my book and the recipe. You are the best!! !